Immaculate 3 bed semi-detached in the village of Ingleton, North Yorkshire. An ideal home for families, the property benefits from off-road parking for up to 6 cars, garage, immaculate gardens and a sun room. With a good primary school close by, secondary education is available at QES & Settle. The village has a range of shops, pubs and places to eat and is a gateway to the Yorkshire Dales National Park. Viewing is highly recommended. On the ground floor the accommodation comprises, a spacious hall, shower room, living room with feature bay and sliding doors to the dining room, along with a good-sized modern fitted kitchen. 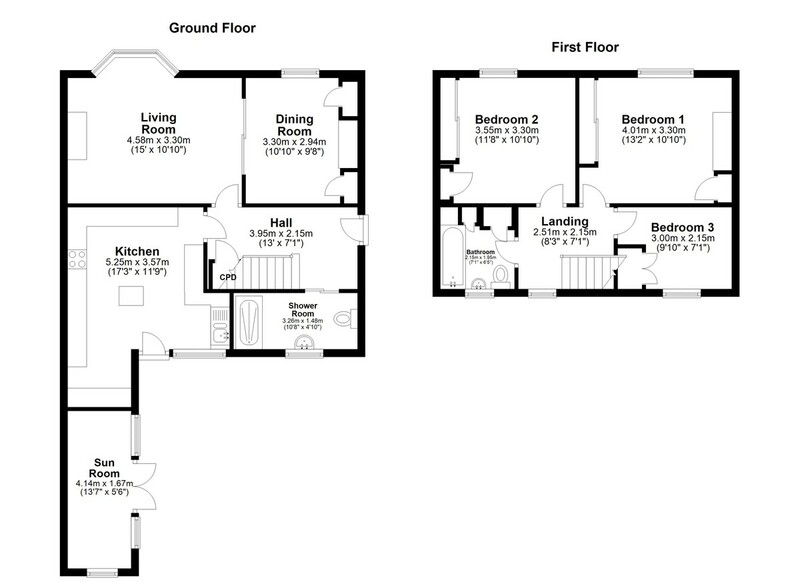 On the first floor there are 2 double bedrooms, a single and the family bathroom. The property provides plenty of storage space throughout. Outside, 1 Burnmoor View is in a good plot with generous and well-tended gardens to the front and rear. The large drive is suitable for up to 6 cars. There is also a garage, along with two sheds and a store. A real feature is the sun room, along with a pleasant patio seating area and built-in barbeque. Fully double glazed, the property is on mains water, drainage, electricity and has gas central heating. As well as the Dales, the Forest of Bowland AONB is close at hand and the Lake District can be reached within under an hour. Trains can be caught at Bentham on the Leeds/Lancaster line. Lancaster and the M6 are half an hour by car. The popular market towns of Settle and Kirkby Lonsdale are a short drive away and both have Booths supermarkets. The A65 provides easy access to Kendal and Skipton. HALL 12' 11" x 7' 0" (3.95m x 2.15m) Good-sized hall with UPVC double glazed entrance door to the driveway. Stairs to first floor with storage cupboard under housing the consumer unit. Carpet. Radiator. Doors to the shower room, living room and kitchen. SHOWER ROOM 10' 8" x 4' 10" (3.26m x 1.48m) UPVC double glazed window to the rear aspect. WC, wash hand basin and large shower. Extractor. Vinyl flooring. Radiator. LIVING ROOM 15' 0" x 10' 9" (4.58m x 3.30m) Comfortable living room with large UPVC double glazed bay to the front aspect. Fireplace with gas fire and feature alcoves to each side. Carpet. Radiator. Sliding double doors opening to the dining room. DINING ROOM 10' 9" x 9' 7" (3.30m x 2.94m) Dining room with UPVC double glazed window to the front aspect. 2 feature alcoves with built-in cupboards. Carpet. Radiator. KITCHEN 17' 2" x 11' 8" (5.25m x 3.57m) Modern fitted kitchen with UPVC double glazed back door. UPVC double glazed windows to the rear and side aspect, along with a double glazed Velux. Range of wall and base mounted units. Sink with drainer. Integral oven and hob - extractor over. Large integral fridge and freezer. Washing machine and dishwasher included. Space for drier. Gas central heating boiler. Laminate floor. LANDING 8' 2" x 7' 0" (2.51m x 2.15m) Central landing with UPVC double glazed window to the rear aspect. Access to boarded loft via pull down ladder. Carpet. Doors to all accommodation on this level. BEDROOM ONE 13' 1" x 10' 9" (4.01m x 3.30m) Double bedroom with UPVC double glazed window to the front aspect. Built-in wardrobes. Additional smaller built-in wardrobe. Carpet. Radiator. BEDROOM TWO 11' 7" x 10' 9" (3.55m x 3.30m) Another double bedroom currently used as a twin, with UPVC double glazed window to the front aspect. Built-in wardrobes and further built-in cupboard. Carpet. Radiator. BATHROOM 7' 0" x 6' 4" (2.15m x 1.95m) Bathroom with UPVC double glazed window to the rear aspect. WC, wash hand basin and bath with shower over. Built-in cupboards, with back up hot water cylinder. Laminate floor. BEDROOM THREE 9' 10" x 7' 0" (3.00m x 2.15m) Single bedroom with UPVC double glazed window to the rear aspect. Large built-in storage cupboard. Carpet. Radiator. SUN ROOM 13' 6" x 5' 5" (4.14m x 1.67m) Sun room with UPVC double glazed double doors with windows to each side, out to the lawn and patio seating area. UPVC double glazed window to the rear aspect. Light and power. Tiled floor. GARDENS The back garden comprises lawn, patio seating area and built-in barbeque. There are 2 sheds, one with light and power, along with a further timber store. External tap. 2 external lights.